Thinking about the year ahead, it is easy to focus on the big “unknowns” that cast a pall over markets in 2012. The Fiscal Cliff, the European debt crisis and the slowdown in the Chinese economy are all huge uncertainties. However, the single most tangible factor to consider in 2013 is the state of the US employment market. The key question is, will there be a recovery in jobs? As investors, our job is less about discerning why employment is lagging than it is to ascertain an appropriate investment strategy in response to existing and prospective conditions. As a result of the jobless recovery, the US Federal Reserve has been maintaining a very aggressive interest rate environment, attempting to spur recovery through all time low interest rates and ever-increasing purchases of outstanding bonds. Just last week, the Fed made it clear it would not move to raise interest rates until unemployment falls below 6.5%, significantly under the current unemployment rate of 7.7%. Today, 58 months after the beginning of the 2007 recession, US employment is only 97% of its pre-recession level. Job creation has been non-existent! By comparison, 58 months after the beginning of the 1973 and 1982 recessions, the comparative US employment levels were 112% and 108% respectively. The result of Fed policy is abnormally low interest rates. The yields on T-bills and 10-year bonds are lower than they have been since the 1950s. For investors seeking income to meet their living requirements, the impact of aggressive Fed policy has been repressive. The idea of earning a lifestyle-maintaining return from low-risk government bonds is no longer possible for most retirees. Investors are turning to bond alternatives, such as dividend-paying equities, to meet their increasing income needs. 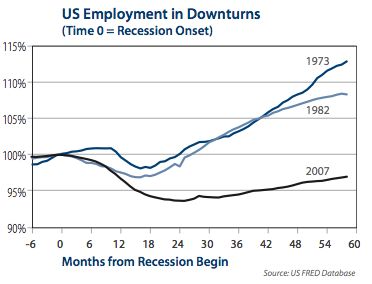 The US employment recovery has only two ways to go. If jobs do not recover interest rates will remain low. As they have since the downturn, well-capitalized yield stocks should fare relatively well as a viable income alternative to bonds. If employment picks up, as targeted by Fed policy, so too should earnings; an event that should be much more positive for stocks than bonds. In either scenario, dividend-paying equities offering a better risk-reward opportunity than that available from traditional fixed-income alternatives.